Nymphaea odorata, also known as the American white waterlily, fragrant water-lily, beaver root, fragrant white water lily, white water lily, sweet-scented white water lily, and sweet-scented water lily, is an aquatic plant belonging to the genus Nymphaea. It can commonly be found in shallow lakes, ponds, and permanent slow moving waters throughout North America where it ranges from Central America to northern Canada. It is also reported from Brazil and Guyana. This plant is rooted from a branched rhizomes which gives rise to long petioles which terminate in smooth floating leaves. Since the leaves are subject to tearing by water and waves, they are round with a waxy upper coating that is water-repellent. The flowers also float. They are radially symmetric with prominent yellow stamens and many white petals. The flowers open each day and close again each night and are very fragrant. Once the flowers are pollinated, the developing fruit is pulled back under water for maturation. Plant systematists often use it as a typical member of Nymphaeaceae, which (other than Amborella) is the most basal of the flowering plants. 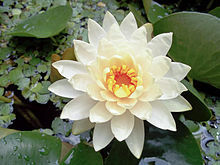 It is cultivated in aquatic gardens as an ornamental plant. It is invasive and weedy on the west coast of North America. 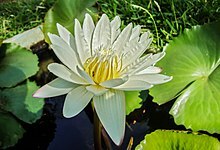 The fragrant water-lily has both medicinal and edible parts. The seeds, leaves, flowers and rhizomes can all be eaten. The rhizomes were also used by first nations to treat coughs and colds. The stem could be used to treat tooth aches if placed directly on the tooth. The lignans nymphaeoside A and icariside E, and the flavonols kaempferol 3-O-alpha-l-rhamnopyranoside (afzelin), quercetin 3-O-alpha-l-rhamnopyranoside (quercitrin), myricetin 3-O-alpha-l-rhamnopyranoside (myricitrin), quercetin 3-O-(6'-O-acetyl)-beta-d-galactopyranoside, myricetin 3-O-beta-d-galactopyranoside and myricetin 3-O-(6'-O-acetyl)-beta-d-galactopyranoside can be found in N. odorata. ^ "Nymphaea odorata". Natural Resources Conservation Service PLANTS Database. USDA. Retrieved 29 January 2016. ^ "Lady Bird Johnson Nymphaea Odorata". Retrieved May 30, 2015. ^ Scoggan, H. J. 1978. Dicotyledoneae (Saururaceae to Violaceae). 3: 547–1115. In Flora of Canada. National Museums of Canada, Ottawa. ^ Sculthorpe, C. D. (1967). The Biology of Aquatic Vascular Plants. Reprinted 1985 Edward Arnold, by London. ^ Keddy, P.A. 2010. Wetland Ecology: Principles and Conservation (2nd edition). Cambridge University Press, Cambridge, UK. 497 p.
^ Judd, W. S., C. S. Campbell, E.A. Kellogg, P. F. Stevens, and M. J. Donoghue. 2002. Plant Systematics: A Phylogenetic Approach. 2nd edn. Sunderland: Sinauer. ^ Zhang, Z; Elsohly, HN; Li, XC; Khan, SI; Broedel Jr, SE; Raulli, RE; Cihlar, RL; Burandt, C; Walker, LA (2003). "Phenolic compounds from Nymphaea odorata". Journal of Natural Products. 66 (4): 548–50. doi:10.1021/np020442j. PMID 12713413.